Not many travelers make Cisternino a destination and that is part of its appeal as an uncrowded small town inviting you to explore its narrow alleys and arched streets. 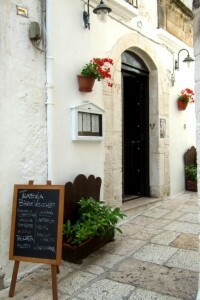 When I was in Italy this Spring I made Cisternino part of a day trip to Alberobello and Martina Franca. I totally enjoyed the fact that the only people I saw were the locals and I was able to glean a sense of their lifestyle in that short time. Cisternino is a small commune in Puglia about 31 miles northwest of Brindisi, the narrow southern peninsula of mainland Italy which is frequently referred to as the “heel.” Not that many tourists frequent Puglia although it is quickly catching on in popularity especially with the Italians and Europeans s they can book inexpensive flights to this region. This medieval village is perfect for wandering around with no agenda, one of my favorite things to do. White stone homes and buildings dominate the town, and branching out from the main piazzas I found arched alleyways where I could almost touch both walls at the same time. As in other little villages, flowers were everywhere, on balconies and overhanging archways, and it was beautiful. 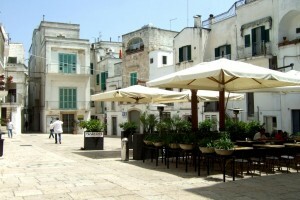 In the centro storico, or historic center, are examples of architecture dating back to the 11th through the 17th centuries. The entrance to Cisternino is through the Porta Grande, which is an 11th century 50 foot tall medieval tower, also called “La Torre di Porto Grande.” On top of the structure is a small statue of Saint Nicolas. The tower faces the main piazza, Piazza Vittorio Emanuele, and is near the Basilica of Cisternino, the 13th century Roman style Church of Saint Nicolas of Patara. 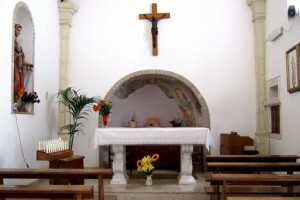 This is considered to be the most important church in Cisternino and it was built on top of an older church dating back to the tenth and eleventh centuries. 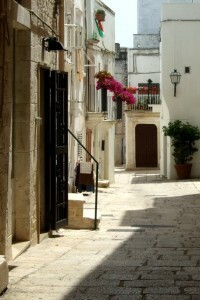 Like many of these small Italian villages Cisternino was spotless. The townspeople were out early sweeping away any dirt in front of their homes and shops, taking pride in their village. When it was lunchtime I asked a local woman to recommend a good place and to my good fortune, she directed me to Trattoria Bere Vecchie, on a small alley off the main square. This moderate sized restaurant was empty and I was welcomed by the owner and cook whom I passed as they were preparing food in the cucina. I wanted to try a regional dish so I had the orchiette pasta with a pomodoro sauce and fresh formaggio. It was amazing and they kept bringing complimentary side orders of sautéed zucchini and some raw vegetables. All this plus a liter of aqua natural for 10 euros! If you have the time to explore these out of the way places in Italy the experience is like none other and the memories and stories are better than anything found in a tourist guide book. Buon viaggio!